Are you ready for some football? My dogs sure are! Somehow I think my dogs have been able to sense the start of the football season. I seem to find them playing with an old football in the backyard more these days. So, in honor of the dogs, here’s some good old fashioned dog play involving footballs of all sizes. Hut one, Hut two, Hut! 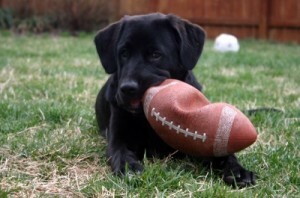 Check out this collection of the best football toys and jerseys for dogs!